Life Stages Theatre tackles and explores social justice issues that face today’s aging population as we advance inexorably through life’s journey. 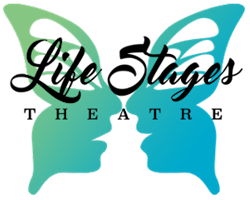 Life Stages Theatre animate the spirit of puppets by creating a conduit, an external voice to the invisible, and the silent thoughts, feelings and emotions portrayed by the live actors on stage. Life Stages Theatre presents a tangible experience that patrons can see, hear, feel and understand. We strive to spark conversation around life issues and challenge our audiences to become, more engaged to create a community of inclusivity and compassion. We believe no one person should struggle alone. Ask about how we can help you sponsor your own show today! One woman’s journey to embrace herself in the midst of losing who she is! Mentored and dramaturg with Jeny Cassidy, master puppeteer and founder of Vancouver International puppet festival! “Mii Other Woman,” is a One Woman Puppet musical with original music composed by Jocelyn Johnson for songs and instrumentals King Aurous, lyrics by Michelle Warkentin.”Mii Other Woman“, takes the audience on one woman’s journey of discovery when she is faced with the challenges of dementia. Maybe those parts of us that seem lost or unseen exist behind the veil where dreams can still happen and memories survive. A fun uplifting and interactive show which launches at the Calgary Fringe Festival. Tickets available online July 1st at https://www.showclix.com/event/mii-other-woman. Dementia becomes a live, invisible force that exposes a family to life choices that have and will continue to change everyone. Opening May 30th 2017 at the Inkubator Theatre in Eau Claire Market. Attending, “Family Tear”, was heart opening. Michelle’s writing and the ability of the puppet to capture the mystery of Alzheimer’s was remarkable. The capacity with which the play introduced and connected me to grief, family struggle and the mysterious experience of how one might actually experience being trapped in the body mind of dementia offered us a glimpse into the depth of both the producer and writer’s experience of human suffering. The simplicity of the set structure opened up space for the imagination. A remarkable event. 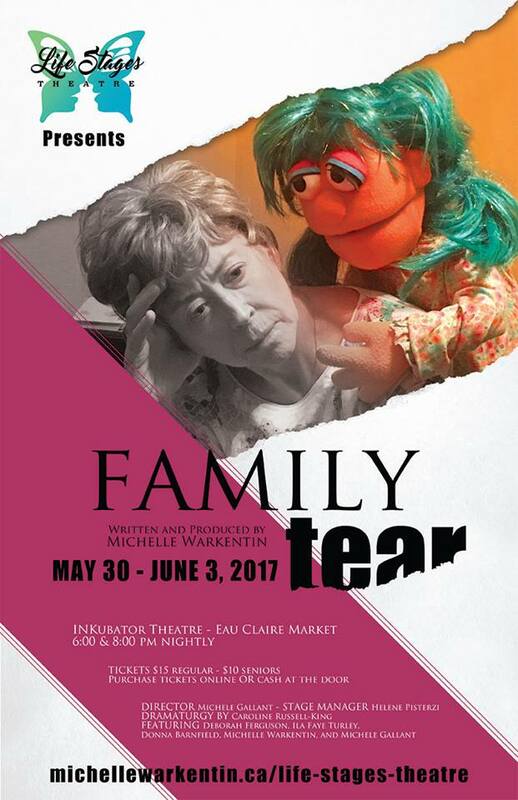 Recently I attended the performance of the play “Family Tear” that was written and then performed by Michelle Warkentin, her puppet and three other female actors. The play explored the subject of a senior mother with dementia, who lived with an adult single daughter who was being treated for cancer. Another successful adult daughter appeared disconnected from the circumstances and did not visit often. The play was compelling in its truthful and heartbreaking portrayal of the advancement of the disease known as Alzheimer’s and its impact on both the patient and the family members. In this play we witness and personally experience the emotions of the ill daughter facing treatment with no family support. Michelle’s puppet is skillfully used throughout the play to demonstrate the losses that an individual with Alzheimer’s disease may experience over time. Family Tear tackles a serious topic. At the same time it delivers hope through the compassionate care of a nurse and then through eventual healing of family wounds. The play also reminds us that family members may have different life circumstances. Communication and patience are important coping strategies. The portrayal of the entire family experience was deeply moving. The silence and stillness in the theater throughout the performance reflected the depth of the patron’s emotions. Many individuals wept silent tears. My own parent was a victim of Alzheimer’s. So personally, I was profoundly moved by Michelle’s creative interpretation of this complex life experience. As a Reg. Clinical Counsellor with a previous nursing background, I strongly recommend this play for family members of a patient, for Health Care and Mental Health Professionals.